Made from 100% Marion Blackberries, Tomasello Blackberry Wine is a full-bodied fruit wine with a dominant cassis and brambleberry character. It is moderately sweet and can be served both as a dessert wine or added to a dish like English Trifle. In classical French cooking, it can be used to make our Filet Mignon with Blackberry Wine Reduction! 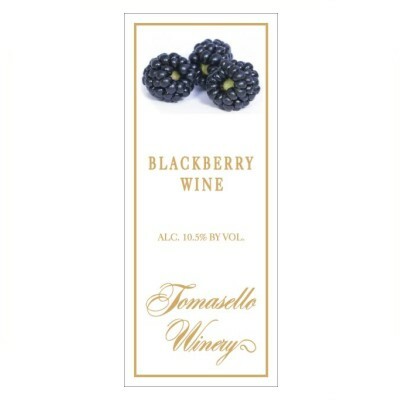 Made from 100% Marion Blackberries, Tomasello Blackberry Wine is a full-bodied blackberry wine with a dominant cassis and brambleberry character. It is moderately sweet and can be served both as a dessert wine or added to a dessert like English Triffle, esp. Tomasello Blackberry Wine. In classical French cooking, Tomasello Blackberry Wine can be made into a sauce reduction. Try our Filet Mignon with Blackberry Wine Reduction.